When my friend confessed that she bought ready-made pizza dough because she couldn’t manage to raise her own yeast dough, I sprang into action and arranged a get-together at her home. It was a great opportunity for me to invade her sparkling new kitchen with to-die-for granite counter space and stainless steel wardrobe of a fridge. With a Manga-crazy teenager to keep my kids entertained and a six-month-old to keep us busy, her Humboldt Park condo was the perfect place for a pizza party with assorted offspring. I love making dough. Kneading is a fantastic stress reliever. You can knead out a weeks’ load of sorrows, arguments, the kids’ D’s and F’s, your melting paycheck, the crazy landlady… I love to do it by hand – a bread machine or mixer will never give you the same satisfaction. Then comes the raising of the dough, which is kind of zen – you have to wait, be patient, keep yourself from peeking under the cloth so as not to disturb the yeast at work. At least this is one part I don’t have to be worried about any more since a friend showed me a trick he learned form a TV show – to place the dough on a wooden board and cover it with a big glass salad bowl. What enlightenment! Now I can watch it bubbling, rising and sweating under the bowl. This method works for every yeast dough and is great entertainment for kids – big and small. Especially the part when ours actually lifted the gigantic bowl to the cheers of six people – if you count the baby’s screams. I hadn’t had such fun since we moved to the City of Big Shoulders. The bowl also solves the old problem of finding a draft-free place in your home. As I’ve learned during the last six months, there’s no such place in a Chicago house – old or new, brick or frame. The temperature released during fermentation provides an ideal moist environment under the bowl that keeps the dough’s surface from drying. Making pizza with friends is the ultimate party-pleaser. Everybody loves it (well, except my daughter) and everybody can choose exactly what to put on it. We placed bowls filled with olives, pepperoncini, thinly sliced baby portobello mushrooms, mozzarella cheese, grated Parmesan, salami, preservative-free pork sausage from my neighborhood Polish deli, sauteed onion, fresh ricotta, roasted bell peppers, baby arugula. Once the dough had risen, everybody had a chance the roll his/her own pizza, and to spread and toss it with whatever they fancied. Even the teenager got involved, to her mother’s astonishment. The grownups washed it down with Zlatý Bažant beer – one of Slovakia’s finest gifts to the world – while the kids were happy with sparkling cranberry juice. After years of trying various pizza dough recipes, I’ve come to prefer the one given by Jamie Oliver in his best cookbook yet – Jamie at Home. 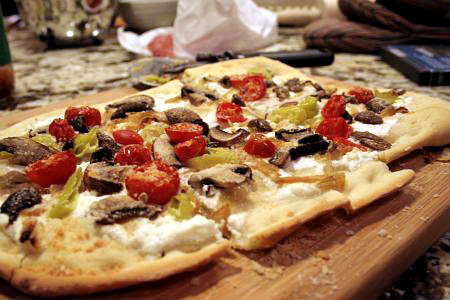 It makes enough for a party, and produces the kind of thin, crunchy pizza I love. The new food lexicon would place that under “rustic” or even “boutique”, a term that drives me nuts every time I see it printed (but that’s for another post, when I get really fed up with nonsense high-profile food magazines). I never aim to get a round base. 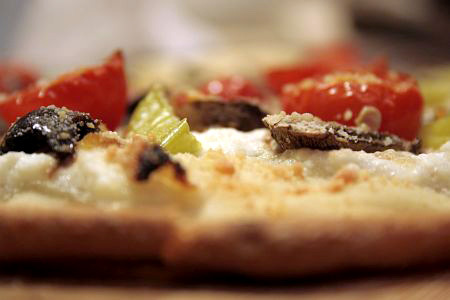 Pizza making should be fun, not a perfectionist nightmare. I strongly suggest going for the whole recipe – the leftover dough can be frozen. To use it – defrost and let rise once. Sift the flour and the salt into a big mixing bowl or clean surface and make a well in the middle. Mix the water with the sugar, yeast and olive oil. Leave for a few minutes to activate the yeast, than pour into the flour well. Using a fork start incorporating the flour into the liquid with a rotating movement. When it starts to come together start kneading until you have a smooth, elastic dough that doesn’t stick to your hands. Don’t worry if some of the flour is not incorporated – there are many factors that influence a dough – the type of flour, the humidity in the room, the temperature. The golden rule is “you can easily add more flour to a sticky dough, but not more moisture to a hard one”. Place the dough shaped into a ball on a large chopping board sprinkled with flour, dust it with some more flour and cover with a glass bowl at least twice as big as the dough. It should take it up to an hour to double its size. Place the dough on a floured surface and knead carefully, pushing from the middle away from you. Turn the dough in a clockwise direction and push again; keep repeating from all sides. This is needed to knock out some of the air bubbles created while the dough was rising. Fold the dough into a ball again and let it rest for 10 minutes. Now is the moment to turn your oven on and heat it to the highest temperature it lets you. Mine goes up to 450°F (230°C). If there are no kids around you can preheat the baking tray also, but as part of the fun of the party was that everybody got to play with their pizza, this was not an option for us. 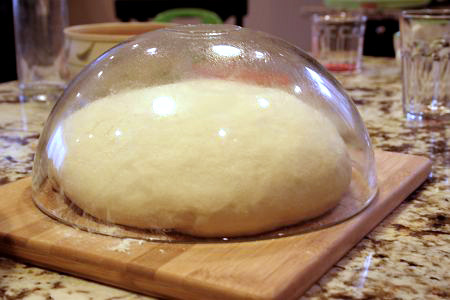 Pull a piece of the dough (the size of a softball) and roll it thin on a floured surface – the shape doesn’t matter. With the tips of your fingers make little indents all the way around the base about ½ inch (1 cm) from the edge – this is a trick I learned from a recipe for Turkish pizza. This makes the edges puff when baked – looks great. Now spread the pizza with about 2 tbsp of tomato sauce, leaving the edges free – don’t overdo it or the center will get soggy. Sprinkle with whatever you like and bake until the dough is golden brown. Cut into irregular pieces and dig in. Continue till everybody is stuffed and happy. My personal favorite is white pizza. Spread the rolled dough with a few spoons of fresh ricotta, sprinkle with sauteed onion and grated Parmesan and some sea salt. You can add olives and sliced rounds of cherry tomatoes for more dramatic effect. When out of the oven add baby arugula – makes a stunning presentation and adds great flavor. This entry was posted on Saturday, February 7th, 2009 at 6:01 am	and is filed under Kids, Mains, Recipes. You can follow any responses to this entry through the RSS 2.0 feed. You can leave a response, or trackback from your own site.